In this paper, we have adopted Fayyad et al.’s definition of knowledge discovery and data mining. Knowledge discovery is the “non-trivial process of identifying valid, novel, potentially useful and ultimately understandable patterns in data”  . Data mining is one of the steps in the process of knowledge discovery, consists of applying data analysis and discovery (learning) algorithms that produce a particular enumeration of patterns (or models) over the data.   . Data mining could also be characterized as the procedure of finding useful patterns or meaning in raw data which subsequently can be used to develop a predictive model  - . It is variously been called as KDD (knowledge discovery in databases), knowledge discovery, knowledge extraction, information discovery, information harvesting, data archeology and data pattern processing  . Knowledge discovery involves the additional steps of target data set selection, data preprocessing, and data reduction (reducing the number of variables), which occur prior to data mining. It also involves the additional steps of information interpretation and consolidation of the information extracted during the data mining process. These extracted patterns will provide useful knowledge to decision makers  . Application of data mining are many—it has been utilized seriously and also widely by marketers, for direct marketing and cross-selling or up-selling; by financial institutions, for credit scoring and fraud detection; by manufacturers, for quality control and maintenance scheduling and by retailers, for market segmentation and store layout  . Data mining is becoming increasingly popular, if not increasingly essential in healthcare industry as well. It is so because modern medicine and various healthcare transactions generate almost daily, huge amounts of heterogeneous data that is too complex and voluminous to be processed and analyzed by traditional methods. For example, medical data may contain SPECT images, signals like ECG, clinical information like temperature, cholesterol levels, etc., as well as the physician’s interpretation. Those who deal with such data understand that there is a widening gap between data collection and data comprehension. Computerized techniques are needed to help humans address this problem  . Data mining provides the methodology and technology to transform these mounds of data into useful information for decision making, with the intention of offer valuable quality services at reasonable costs, which is a main concern envisage by the healthcare organizations (hospitals, medical centers). Data mining applications can incredibly profit all stake holders of the healthcare industry such as hospitals, clinics, physicians, and patients, for example, by identifying effective treatments and best practices. This paper presents an application of data mining in early detection and prevention of oral cancer and discusses how the generated patterns can be effectively used by physicians. The World Health Organization’s Global Burden of Disease statistics distinguished malignancy or cancer as the second largest global cause of death, after cardiovascular disease  . Cancer is the fastest growing segment of the disease burden; global cancer deaths are anticipated to increase from 7.1 million in 2002 to 11.5 million in 2030  . Advances in prevention, diagnostics and treatment of cancer have contributed to the improved prognosis for cancer patients: one third of cancers are preventable and another third are curable through early detection and effective therapy  . The objective of this article is to explore relevant literature and present the same in Section 2, cover the information about oral cancer in Section 3, examine the data mining methodology and then appropriate algorithm to implement in Section 4. Experimental results are presented in Section 5 and finally Section 6 highlights the conclusions and offers some future directions. At the end, acknowledgement and references are mentioned. Kaladhar et al. 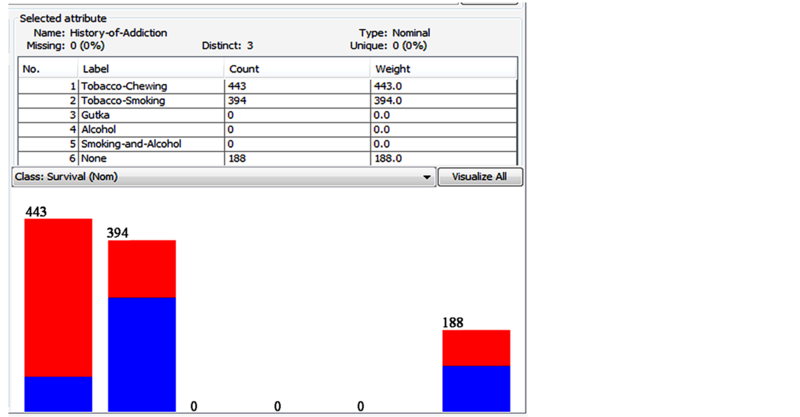 predict oral cancer survivability using the CART, Random Forest, LMT, and Naïve Bayesian classification algorithms, which classify the cancer survival using 10 fold cross validation and training dataset. Among these algorithms, the Random Forest technique classifies more accurately the cancer survival dataset as compared to other methods. Singh et al. have applied the apriori algorithm with transaction reduction on the data of cancer symptoms by considering five different types of cancer to find the symptoms that help the cancer to spread and also the cancer type that spreads faster. Srikant et al. have considered the problem of integrating constraints in the form of boolean expression that appoint the presence or absence of items in rules. Nahar et al. discuss the significant prevention factors for a particular type of cancer. To find out the prevention factors, they have first constructed a prevention factor dataset through an extensive literature review and then three association rule mining algorithms: Apriori, Predictive apriori, and Tertius algorithms have been applied on that data to discover most of the significant prevention factors against a specific type of cancer. Experimental results illustrate that the Apriori is the most useful association rule-mining algorithm for discovery of the prevention factors. Swami et al. discuss the multidimensional association rules and the model for smoking habits in order to take some preventive measures to reduce the various habits of smoking in youths. Milovic et al. discuss the applicability of data mining in healthcare and explain how the patterns can be used by physicians to determine diagnoses, prognoses, and apply for patients in healthcare organizations. A detailed survey on various methods adopted by the researchers for identification and classification of oral cancer detection at an earlier stage has been given in  . Chuang et al. consider DNA repair genes by choosing a single nucleotide polymorphisms (SNPs) dataset with 238 samples of oral cancer and control patients for disease prediction. They report that the performance of the holdout cross validation is much better than cross validation and the best classification accuracy is 64.2%. Gadewal et al. have enlarged the oral cancer gene database to 374 genes by adding 132 gene entries to enable fast retrieval of updated information. Oral malignancy is a heterogeneous assembly of tumors rolling out from diverse parts of the oral cavity, with distinctive predisposing factors, prevalence, and treatment outcomes. Oral tumor is one of the ten most incessant diseases worldwide with a yearly occurrence of over 300,000 cases, of which 62% arise in developing nations   . There is a huge contrast in the rate of oral tumor in diverse regions of the worlds. The age-adjusted rates of oral tumor differ from over 20 for every 100,000 population in India, to 10 for every 100,000 population in the U.S., and less than 2 for every 100,000 population in the Middle East   . In comparison with the U.S. population, where oral cavity malignancy represents only about of 3% of malignancies, it accounts for over 30% of all growths in India. It has been estimated that 83,000 new oral cancer cases occur every year iIn India   . The variation in incidence and pattern of oral cancer is due to regional differences in the prevalence of risk factors. But as oral cancer has well-defined risk factors, these may be modified—giving real hope for primary prevention. The clinician's issue is separating malignant lesions from a nearly infinite amount of other poorly characterized, questionable, and crudely comprehended lesions that also occur in the oral cavity. Most oral lesions are benign, yet many have a manifestation that may be effectively befuddled with threatening lesions and some are now considered pre-malignant because they have been statistically correlated with subsequently cancerous changes  . On the other hand, some malignant lesions seen in an early stage may mistaken for a benign. Early carcinomas are presumably asymptotic and ensuing signs are regularly misjudged in light of the fact that they imitate numerous benevolent lesions and the distress is negligible. Professional consultation is thus often delayed, increasing the chance for local spread and regional metastases. Stress must be placed on gaining access to high risk individuals for periodic oral examinations and educational efforts to increase the skill of primary health care providers in recognizing this problem. Squamous cell carcinoma accounts for 90% of the total number of malignant oral lesions. Therefore, the problem of oral cancer is primarily that of pathogenesis, diagnosis, and management of squamous cell carcinoma originating from oral muscular surface  . The aim of this work is to apply the association rule mining on the data pertaining to clinical symptoms, history of addiction, co-morbid condition and survivability in order to evaluate the clinical features, diagnosis, and treatment of oral cancer patients. Data mining technique, association rule mining is applied to search the hidden relationships among the attributes. It identifies strong rules discovered in databases using different measures of interestingness. Thus, an association rule is a pattern that states when X occurs, Y occurs with certain probability. In this paper, we adopt the standard definition of association rules  - . Apriori algorithm: Candidate Generation and Test Approach Step 1: Initially, scan database (DB) once to get frequent 1-itemset. 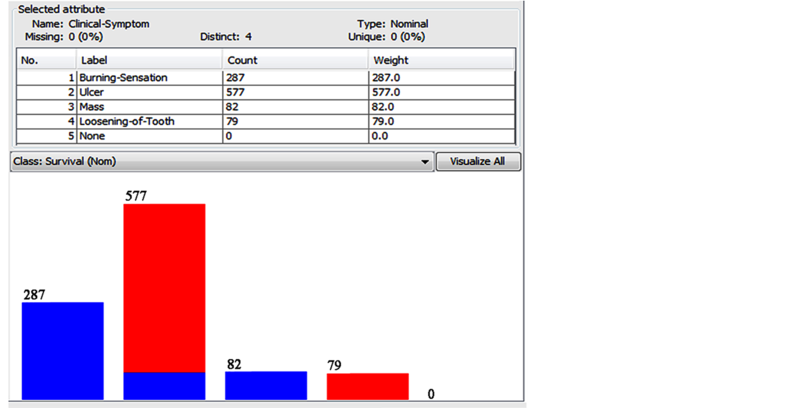 Step 2: Generate length (k + 1) candidate item sets from length k frequent item sets. Step 3: Test candidates against DB. Step 4: Terminate, if no frequent or candidate set can be Generated. 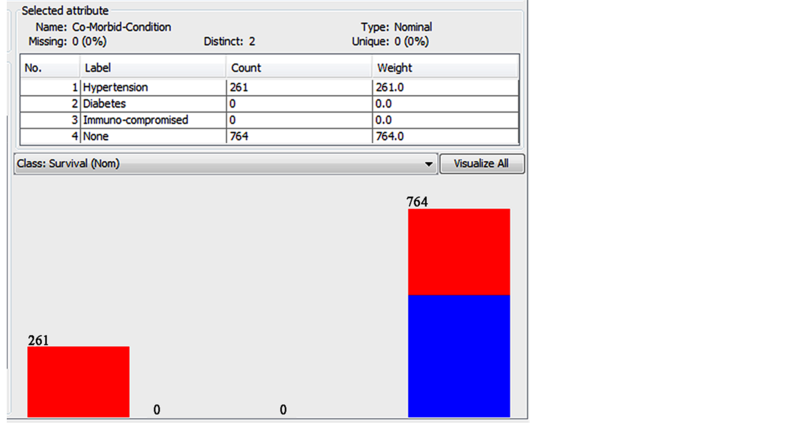 To select interesting rules from the set of all possible rules generated, constraints on various measures of significance and interest can be used. The best-known constraints are minimum thresholds on support and confidence. Figure 1. Flowchart of apriori algorithm. Support: The rule holds with support supp in T (the transaction data set) if supp % of transactions contain  . Confidence: The rule holds with confidence conf in T if conf % of transactions that contain X also contain Y   . Lift: It is the probability of the observed support to that expected, if X and Y were independent . Leverage: It measures the difference of X and Y appearing together in the dataset and what would be expected if X and Y were statistically dependent  . Conviction: It is the probability of the expected frequency that X occurs without Y (that is to say, the frequency that the rule makes an incorrect prediction)  . Rule 1. Clinical-Symptom = Ulcer (577) ==> Survival = Dead (498) < conf: (0.98) > lift: (2.31) lev: (0.24)  conv:(28.27). Rule 2. Clinical-Symptom = Burning-Sensation (287) ==> Survival = alive (286) < conf: (1) > lift: (2.27) lev: (0.16)  conv: (80.64). Rule Details: Rule 1 and Rule 2 suggest ulcer as the clinical symptom may indicate oral cancer with more certainty in comparison to other clinical symptoms like burning sensation, loosening of tooth and mass, which subsequently lead to high mortality. Rule 3. History-of-Addiction = Tobacco-Smoking and History-of-Addiction1 = Alcohol (131) ==> Survival = Dead (131) < conf: (1) > lift: (2.6) lev: (0.08)  conv: (80.64). Figure 2. Clinical symptoms and survivability. Figure 3. History of addiction and survivability. Figure 4. Co-morbid condition and survivability. higher for tobacco users who drink alcohol heavily. In fact, three out of four oral cancers occur in people who use alcohol, tobacco, or both alcohol and tobacco. Rule 4. Co-Morbid-Condition = Hypertension (261) ==> Survival = Dead (261) < conf: (1) > lift: (1.78) lev: (0.11)  conv: (114.33). Rule Details: Rule 4 puts forward that co-morbid condition like hypertension may also be a reason for oral cancer and subsequently for high mortality. Rule 5. Clinical-Symptom = Ulcer and History-of-Addiction = Tobacco-Smoking (131) ==> Survival = Dead (131) < conf: (1) > lift: (1.78) lev: (0.06)  conv: (57.38). Rule Details: Rule 5 suggests that if clinical-Symptom is ulcer and history of addiction is tobacco-smoking, chances of patients suffering from oral cancer is high which may lead to mortality. Rule 6. History-of-Addiction = Tobacco-Chewing and Co-Morbid-Condition = Hypertension (130) ==> Survival = Dead (130) < conf: (1) > lift: (1.78) lev: (0.06)  conv: (56.95). Rule 7. History-of-Addiction = Tobacco-Smoking and Co-Morbid-Condition = Hypertension (131) ==> Survival = Dead (131) < conf: (1) > lift: (1.78) lev: (0.06)  conv: (57.38). Rule Details: Rule 6 and Rule 7 hint that history of addiction like tobacco-smoking and tobacco-chewing along with co-morbid condition like hypertension increases the probability of oral cancer which may be the reason for high mortality. If Clinical Symptoms = Ulcer. If History of Addiction = Tobacco-Chewing/Smoking or Alcohol. If Co-Morbid Condition = Hypertension. ThenOral Cancer is suspected which has to be confirmed through biopsy and other diagnostic procedure. The data mining technique which is adopted for the research work is association rule mining. 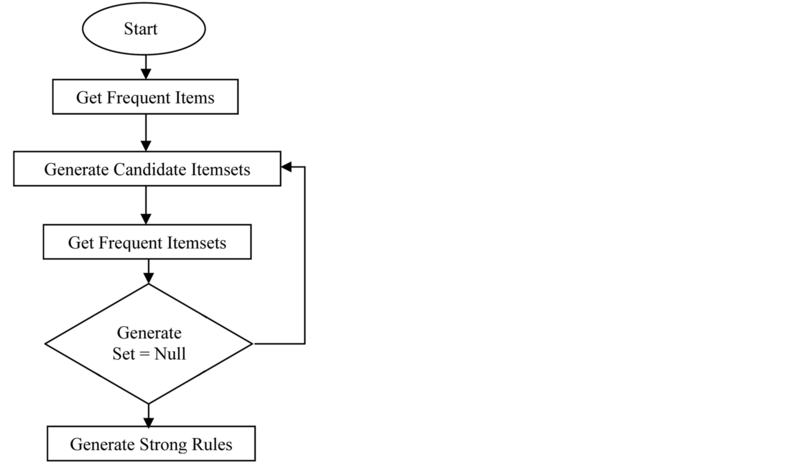 The algorithm used for implementing association rule mining is a popular apriori algorithm. Apriori has been used to extract the association among various valuable data pertaining to clinical symptoms, history of addiction and co-morbid condition. The rules generated would certainly assist the practitioners in early discovery of oral cancer and consequently help in prevention of the disease. The experimental results demonstrate that all the generated rules hold the highest confidence level, thereby, making them very useful for early detection and prevention of oral cancer. In future, we intend to extend this research work by attempting to extract significant patterns and useful rules through the association rule mining algorithm using various attributes like predisposing factors, gross examination, tumor site, tumor size, neck node, etc. and use it more effectively for early detection and prevention of oral cancer. The authors would like to thank Dr. Vijay Sharma, MS, ENT, for his valuable contribution in understanding the occurrence and diagnosis of Oral Cancer. The authors devote their sincere thanks to the management and staff of Indian School of Mines, for their constant support and motivation. Mathers, C.D. and Loncar, D. (2006) Projections of Global Mortality and Burden of Disease. PLOS Medicine, 3, 2002- 2030. Agrawal, R. and Srikant, R. (1994) Fast Algorithms for Mining Association Rules in Large Databases. Proceedings of the 20th International Conference on Very Large Data Bases, VLDB, Santiago de Chile, 12-15 September 1994, 487- 499.